Ralph Johnson of Madison exercises Tuesday at the YMCA of Northern Rock County in downtown Janesville. Johnson works in Janesville and has been a member of the Y for 15 years. Brian Foelker runs on a treadmill Tuesday at the YMCA of Northern Rock County in Janesville. 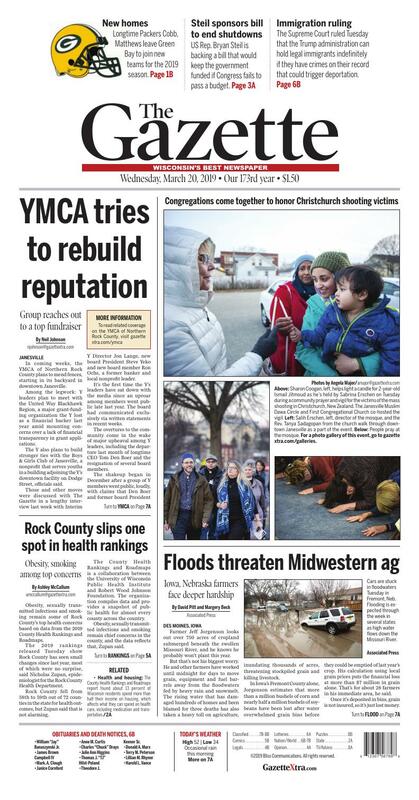 In coming weeks, the YMCA of Northern Rock County plans to mend fences, starting in its backyard in downtown Janesville. Among the legwork: Y leaders plan to meet with the United Way Blackhawk Region, a major grant-funding organization the Y lost as a financial backer last year amid mounting concerns over a lack of financial transparency in grant applications. The Y also plans to build stronger ties with the Boys & Girls Club of Janesville, a nonprofit that serves youths in a building adjoining the Y’s downtown facility on Dodge Street, officials said. Those and other moves were discussed with The Gazette in a lengthy interview last week with Interim Y Director Jon Lange, new board President Steve Yeko and new board member Ron Ochs, a former banker and local nonprofit leader. It’s the first time the Y’s leaders have sat down with the media since an uproar among members went public late last year. The board had communicated exclusively via written statements in recent weeks. The overtures to the community come in the wake of major upheaval among Y leaders, including the departure last month of longtime CEO Tom Den Boer and the resignation of several board members. The shakeup began in December after a group of Y members went public, loudly, with claims that Den Boer and former board President Jason Engledow had improperly terminated board members and suspended members for asking prying questions about the Y’s finances and governance. Yeko and Lange say the Y board is planning outreach to members and a “total overhaul” of how it governs and operates its Janesville and Milton facilities. The Y is in the midst of a review of its finances, operations, bylaws and governance rules by its flagship agency, the YMCA of the USA. Lange, who is CEO of two Y branches in Waukesha and Jefferson counties, plans to spend the next two months helping the YMCA of Northern Rock County recraft its daily operations. The YMCA of the USA is guiding the Y in a national search for a new CEO. This week, the board is hosting feedback sessions to ask members about changes they want to see. Those attending might be a fraction of the 6,900 local Y members, but Lange said it’s an early effort by leaders to be more accessible. In the interview, Lange, Yeko and Ochs declined to discuss why Den Boer left the YMCA after the board placed him on paid leave in January. Engledow, a commercial banker who lives and works north of Milwaukee, resigned from the board earlier this year. Den Boer had acted as the Y’s chief executive, lead fundraiser and sole public relations official for more than a decade, earning an annual paycheck in the mid-six figure range, according to tax documents. Yeko and Lange said the Y and Den Boer reached a “mutual agreement” to part ways during an internal investigation the board ordered in January to look into member concerns. As part of the agreement, they said, the Y likely won’t disclose what led to Den Boer’s departure. Lange said the Y has turned up no signs of criminal wrongdoing in its investigation and reviews, and its national charter was never in jeopardy. Lange and Yeko said the ongoing internal review will yield findings the board will use to rewrite its bylaws and improve operations. They said the findings will be made clear to members through bylaw changes, but it’s unlikely the board will formally disclose errors in governance that might have been made. Yeko, who oversaw Den Boer as a past board president, said the board and the national Y asked him to step in as board president after the most recent president, Jeff Jensen, resigned in January. A local jewelry merchant, Yeko believes it’s time for the Y to move on from months of rancor—even if that comes without the Y issuing a mea culpa to members who said it took more than a year of pleas, public outcry and ultimately legal threats before the board addressed their concerns. In addition to reinstating three board members Den Boer and Engledow wrongfully dismissed in 2017 and 2018, the board has seated four new members recommended by a group of four “concerned” Y members. Along with Ochs, the board has added Janesville attorney Dave Moore, nonprofit consultant Oakleigh Ryan and local oil company employee Thomas Warrichaiet. They come aboard as longtime board member Steve Scaccia and two other board members, Larry Loizzo and Nancy Nelson, resigned earlier this month, Yeko said. Lange said the Y also intends to rejoin Forward Janesville, the city’s chamber of commerce, and strengthen ties with business coalition Downtown Janesville Inc. Board members also will pair up with Janesville Boys & Girls Club officials to tour other Y branches that have strong, in-house partnerships with Boys & Girls Clubs, he said. This summer, the Y will get involved with the Town Square Gran Prix, a major circuit bicycle race that made its first visit to downtown Janesville last year. Under its former leadership, the Y opted not to get involved even though the race was routed past its front doors. “I think our intention is to listen to the members. And I think our intention is to build bridges in the community,” Lange said. Obesity, sexually transmitted infections and smoking remain some of Rock County’s top health concerns based on data from the 2019 County Health Rankings and Roadmaps. The 2019 rankings released Tuesday show Rock County has seen small changes since last year, most of which were no surprise, said Nicholas Zupan, epidemiologist for the Rock County Health Department. Rock County fell from 58th to 59th out of 72 counties in the state for health outcomes, but Zupan said that is not alarming. The County Health Rankings and Roadmaps is a collaboration between the University of Wisconsin Public Health Institute and Robert Wood Johnson Foundation. The organization compiles data and provides a snapshot of public health for almost every county across the country. Obesity, sexually transmitted infections and smoking remain chief concerns in the county, and the data reflects that, Zupan said. Obesity remains on an upward trend in Rock County, with 36 percent of adults having a body mass index of 30 or higher, according to the rankings. About 836 new cases of chlamydia were reported in Rock County in 2016, the most recent year of available data, up from 734 cases in 2015. Among Rock County adults, 19 percent smoke, which is 2 percentage points more than the state’s reported 17 percent, according to the rankings. It is difficult to know based on the health rankings whether local initiatives to reduce obesity, sexually transmitted infections and smoking have been effective because some of the data is dated, Zupan said. The county is doing well at providing opportunities for physical activity, decreasing excessive drinking and maintaining high graduation rates, Zupan said. Eighty-nine percent of Rock County residents have adequate access to locations for physical activity. The percentage of people who reported not being physically active went from 22 percent in 2014 to 20 percent in 2015, the most recent years of available data. The county is doing better than the state in excessive drinking with 21 percent of adults reporting binge or heavy drinking in comparison to the state’s 26 percent. The rankings show a Rock County graduation rate of 94 percent, which Zupan considers a positive. The health department in recent years has focused on the connections between public health and social factors such as income, education and equal access to opportunities, Zupan said. The rankings included data on housing availability for the first time this year, according to a news release. Zupan could not directly link specific Rock County health outcomes to housing but said housing is one of the socioeconomic factors that can play a part in the root causes of health. Housing is an essential need, and when an individual is spending a large portion of his or her income on housing, that leaves less money to pay for health care or proper nutrition, Zupan said. More than 19,000 homes in Rock County were built before 1950, which leads to increased risks of asbestos and lead exposure, according to the health rankings. The health department uses the rankings to guide the department in initiatives or programming to help the community, Zupan said.